The next installment of the regional series takes a look at the Columbia Gorge and Mid-Columbia counties. 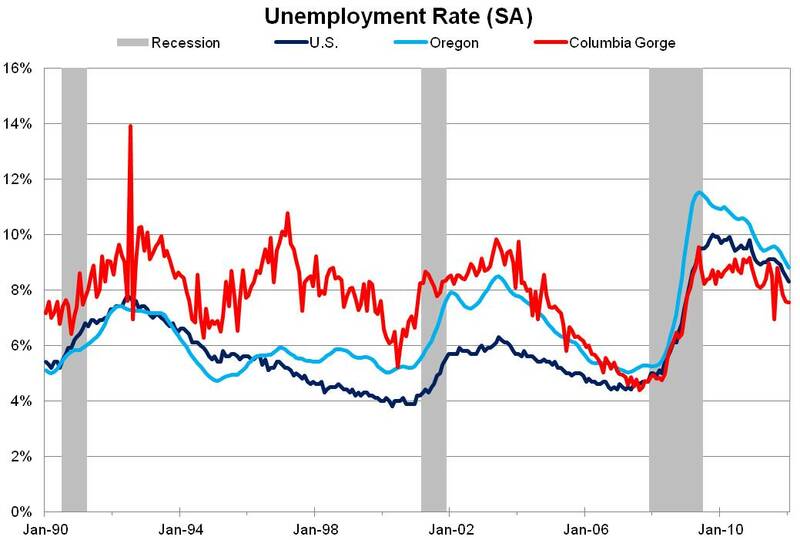 This region has been the best performer, in both employment and unemployment terms, this business cycle and provides an interesting contrast with the previous post on Central Oregon, the worst regional performer this cycle. In keeping with the structure of the regional posts, first up will be the geographical definition of the region, second will be examining the industry structure, third will be comparing employment and unemployment trends over the past 35 years and fourth will be comparing and contrasting the region’s recessions. Finally, given the Columbia River Gorge’s strength this recession, the final portion of the post considers some of the reasons for this strong performance. 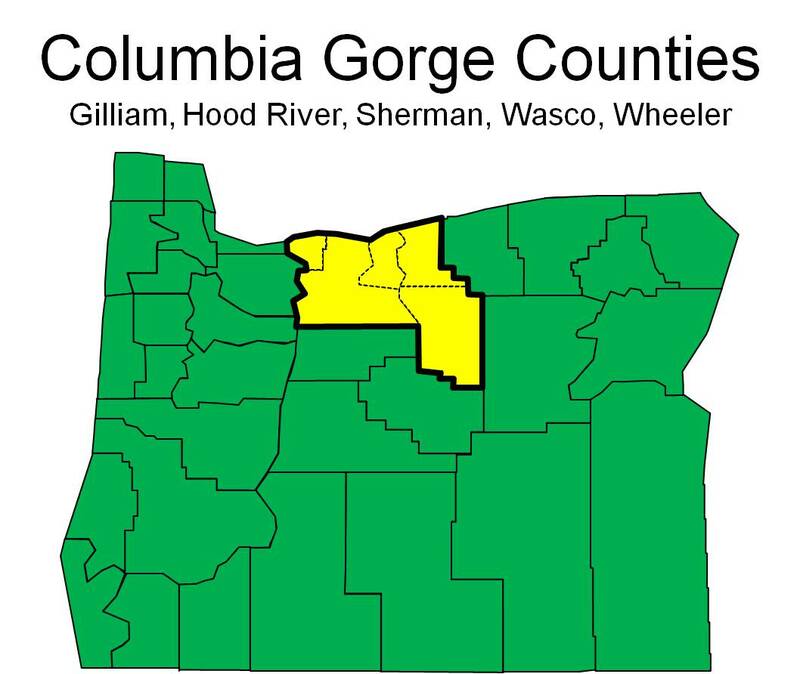 I would like thank Dallas Fridley, Oregon Employment Department’s regional economist for the Gorge and Mid-Columbia counties, for valuable feedback and input on the post. Hood River County is influenced by its agricultural harvest and associated industries, like wholesale trade. A strong summer recreational season plus a winter season make Hood River County quite unique. Likewise, Wasco County employment rises and falls with the arrival of cherry harvest and its value-added processing, while summer also provides a tourism boost. These industries provide a strong underlying trend – but not necessarily the underlying growth. Health care is a good example of a fast growing industry with relatively mild seasonal movement. The region boasts a number of scenic attractions which, in addition to the Columbia River and Columbia Gorge, include the John Day Fossil Beds, Mt. Hood, and national forest areas. Beginning with the completion in 1937 of Bonneville Dam, much of the state’s electricity and water for irrigation has been supplied by the area’s hydroelectric projects, which also include The Dalles and John Day dams. It is important to reiterate the takeaway from the first quote. Agriculture has been a source of economic strength for the region, historically and certainly today, however it is not a big source of growth – that is, employment is fairly steady from year to year (with large seasonal fluctuations, obviously). Health care is a major driver of employment growth in the region as the industry continues to expand, which it should be noted is not a local phenomenon, it is a national trend as the population ages. Now that we know a little bit more about the local economy, let’s take a look at the region’s 2010 location quotients. Location quotients compare the relative size of industries across locations allowing one to see which industries a particular area has a concentration in, or possibly a comparative advantage. A value equal to 1 means the percentage of employment in that industry is the same as the percentage at the national level, while values greater than 1 mean the local area has a higher concentration in that particular industry and values less than 1 are the opposite. Due to the strong agriculture presence in the region (crop production), it is no surprise to see such a high location quotient for the industry overall. Similarly given the increased tourism in recent decades, the region is also strong in restaurants and lodging (leisure and hospitality). The other industry where the region has a high concentration of employment, relative to the state or nation, is in beverage manufacturing. The region boasts a number of breweries and wineries while also being home to at least one large distillery. Now that we know where the region is and what it’s industry structure looks like, how has it fared in (un)employment terms over the past 35 years? The aftermath of the early 1980s left the region with low levels of employment for an extended period of time, very similar to the state overall although the region bounced along the bottom before making a steep climb back to pre-recession levels. 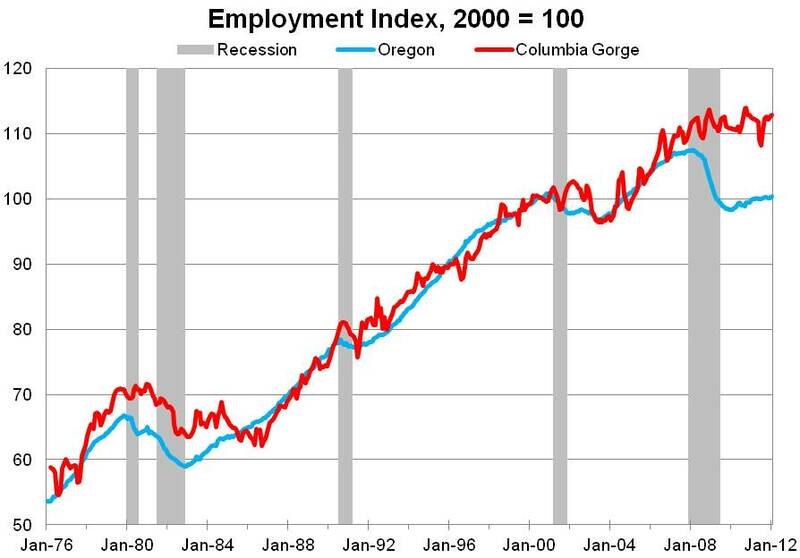 Taking the entire 1976-2007 period as a whole, employment in the Gorge and Mid-Columbia counties closely tracked the statewide figures, however in the past 4 years, the region has clearly outperformed the state. While employment has not continued to grow over the past few years, it did not decline like the rest of the state, making the region a rare source of strength. In terms of the unemployment rate, the region during the 1990-2005 time period was consistently above the state and national figures. 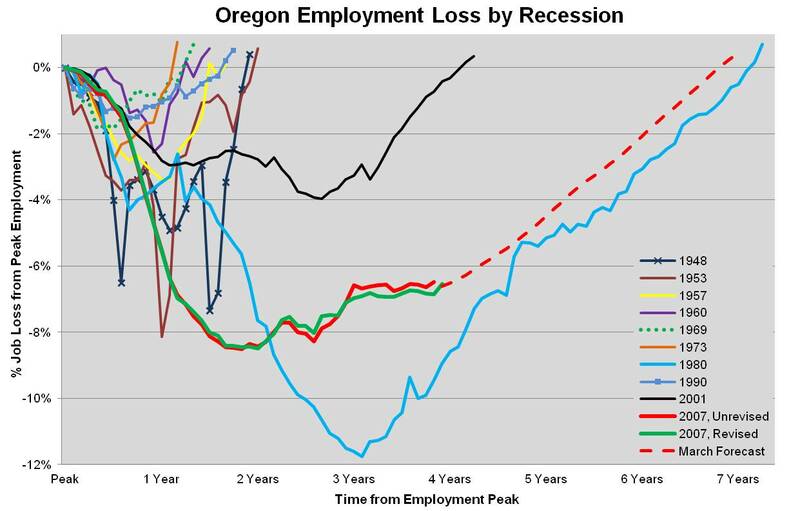 During the bulk of the 2000s expansion the region matched the Oregon unemployment rate and during the recession and recovery to date, the unemployment rate in the Gorge and Mid-Columbia counties has been lower than both the state and the nation. 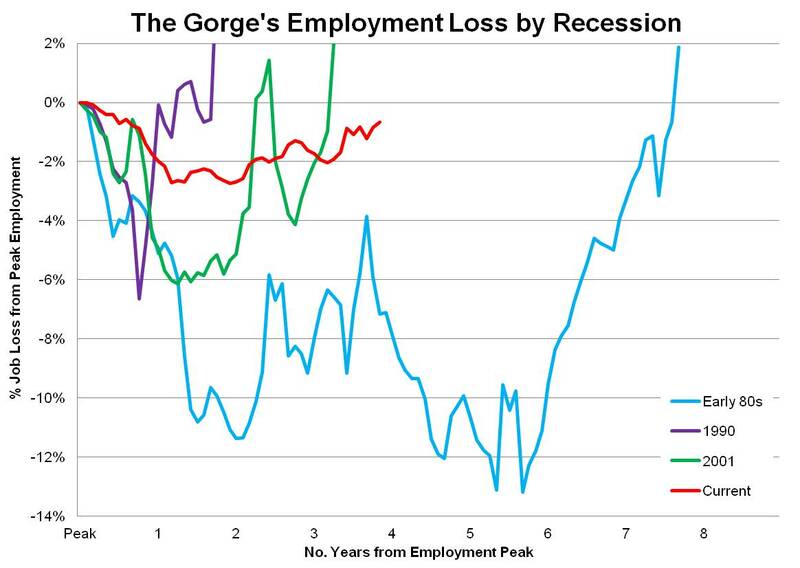 Finally, how do the different recessions compare in the Columbia River Gorge region? The graph below, structured the same as our standard state return to peak graph, illustrates both the depth of job loss by recession and how long it took to regain all the lost jobs. The region has experienced one severe recession in the early 1980s, two relatively deep yet short recessions in 1990 and 2001 (relative to the statewide figures) and one mild recession this business cycle. 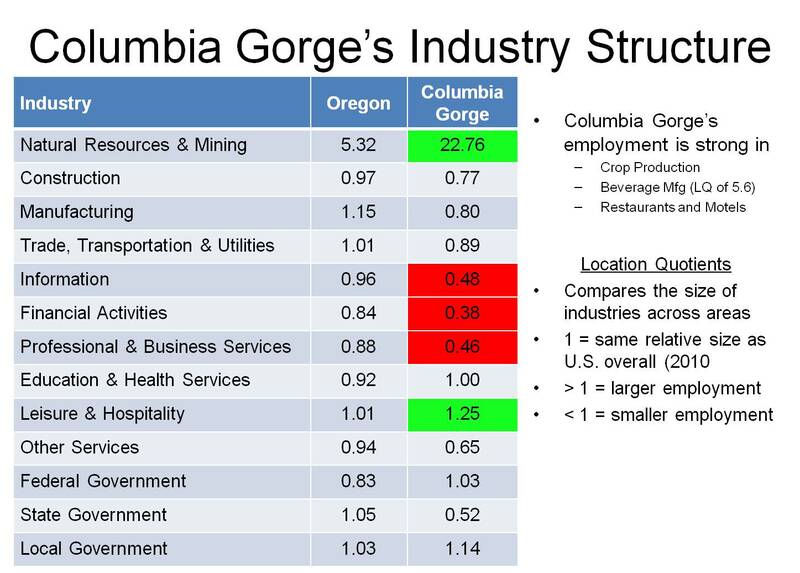 The biggest question is why has the Columbia River Gorge and Mid-Columbia counties performed so well in recent years? In terms of employment, the region’s loss of only a couple percentage points vastly outperforms the state, which lost 8.5 percent of its jobs, and the nation, which lost 6.3 percent of its jobs. While the Gorge and Mid-Columbia counties have not added employment in recent years, the low level of job loss makes the region the state’s strongest performer. In our view there are a number of reasons for this including but not limited to just these specific items: agriculture, alternative energy, drones, Oregon’s side of the river dominates services (health care in particular) and tourism. The region has a sizable and significant agriculture industry, as mentioned at the top of the post. Generally speaking agriculture overall has been a source of strength in recent years and in the Gorge and Mid-Columbia this is also true. The industry has been not only a source of strength but it has also been growing somewhat, providing a boost to the region. In addition to the Columbia River dams which provide a solid, steady base of employment, the influx and creation of wind farms in the Gorge has boosted the local economy. Besides the wind farms on the Oregon side of the river (which stretch from the Gorge into eastern Oregon) there are a number of such farms just across the river in Washington State. While not the largest employers over the long-term, these wind farms represent large investments in the region and the construction phase of the projects certainly provided a local boost. The peak construction phase was back in 2009, just as everywhere else was seeing massive job losses, so these projects provided somewhat of a cushion during the worst of the recession. Another major contributor to the strength of the region are the drones, which have been a growth industry this past decade. See this great, but long, Smithsonian article on the evolution of the industry (both military and civilian) and the entrepreneurs behind the Gorge’s largest employer: Insitu Inc. (Boeing bought the company in 2008) Also see this recent Oregonian article on the company’s recent announcement of expansion in Bingen, WA. Having a growth industry, that is home to your largest private employer which is able to obtain large dollar value and long term contracts is a benefit to any local economy. The geographical distribution of population and businesses of the region is also a source of strength as the Oregon side of the river has the bulk of business and personal services, whereas the Washington side of the region provides little beyond agriculture and Insitu. Hood River and The Dalles are the primary sources for health care, personal services, eating and drinking places, lodging and recreational services and basically anything a consumer could want or need. The secondary impacts from the growth industries in the region can largely be attributed to these two major cities, which are in Oregon. Finally, the steady inflow of tourism dollars aids the local economy. The plethora of scenic attractions and other destinations (e.g. renown restaurants, breweries, wineries, etc) has led to better performance in terms of tourism than the state as a whole. Another likely contributor was the construction phase of the winds farms, which brought in contractors and construction workers from outside the region. An examination of lodging tax data from the Oregon Department of Revenue finds that tax receipts for the Columbia River Gorge counties only declined approximately 2% during the recession whereas the state overall saw a decline of 13%. It should be noted that tourism (recreation, hospitality, retail) has not been a source of growth in the region, rather it has been a relative success story in the sense that it did not decline substantially like the industry did in the rest of the state. That is, rather than being a large negative, it was only a minor drag on the region, which certainly helps as this steady influx of visitors and their tourism dollars are a boost for local businesses and employees. The Columbia River Gorge and Mid-Columbia counties are home to a sizable agricultural industry and numerous scenic attractions. Given these strength, the region’s industry structure follows and while these industries may not be leading growth, they provide a solid base for the local economy. Health care, in particular, is an industry with growing employment and the success of the drone industry is a real regional asset as well. While the area is not adding jobs like the Portland MSA currently is the fact remains that the Gorge and Mid-Columbia counties experienced the mildest job loss of any region in Oregon so far over this business cycle and are the state’s strongest performers.